As soon as I turn away from my mother’s door in assisted living and walk down the hallway – away from her, the emotions hit me. You’d think I would be used to them by now. For ten years my family struggled with Dad’s dementia and all the accompanying emotions. Now that Mom has been diagnosed with Alzheimer’s, I should expect the same feelings. But still – the emotions grip my soul and I cry all the way to the car – then sit in the driver’s seat until my vision is no longer blurry. When we become caregivers, certain emotions come to live with us. One of these emotions is sadness. The long goodbye, aka Alzheimer’s, triggers a sadness unlike any other grief I have suffered. It is not the unexpected grief of a sudden loss – a miscarriage, unemployment or illness – but rather the day-by-day grief steps caused by the regressive nature of the disease. Even though Mom remembers me today, she will someday forget how to introduce me to her friends in assisted living. Sad, but true. Another sadness lies ahead. If Mom does not graduate to heaven within the next few years, we will have to relocate her to the nursing home section of the facility. “Never put me in a nursing home.” I can still hear the echo of her plea. Sadness reinforces the truth that at the end of this particular journey, my siblings and I will be orphans. Grief will multiply. Another emotion, rejection, surfaces every time Mom forgets a memory that is important to me. “Remember when?” is no longer a game we play. And when Mom does hesitate with my name, rejection swallows logic. I know she doesn’t mean to reject me. Somewhere, cached in her soul is my baby face, her firstborn. But I miss our shopping trips and the way we used to talk about the books we were reading. I no longer hear her laughter, because she can’t comprehend jokes anymore. When I send her cards and she shows them to me, clearly imprinted with my signature, then tells me they are from someone else – I feel rejected. 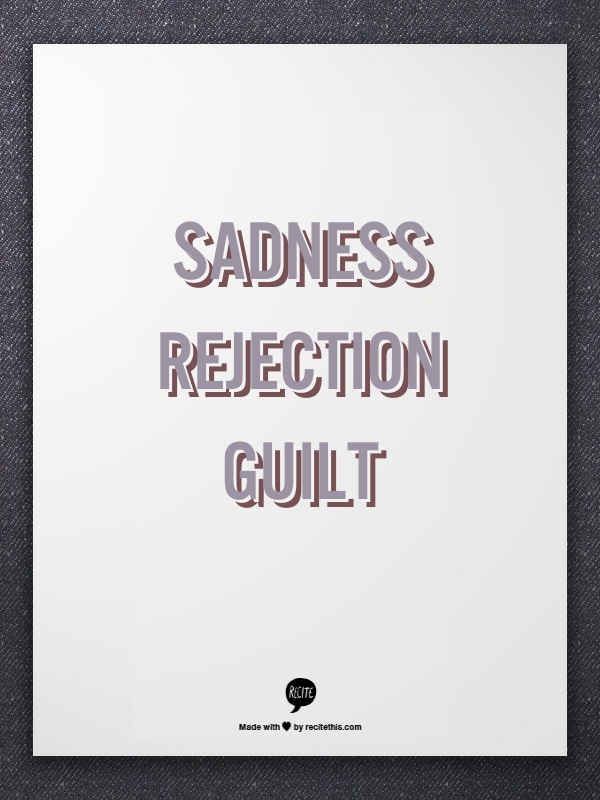 Although sadness and rejection bring pain, guilt is the emotion that tortures me. No, Mom, we never wanted to put you into assisted living, but you couldn’t live alone anymore, and all of us work long hours. No one else can take care of you. I’m sorry and I hate it. I feel guilty. When I hug her goodbye and tell her I have to go back to Kansas, she can’t understand why I’m leaving. Reality screams that my work is a state away, and my life cannot make room for my mother. I am the long-distance caregiver in the family, demoted by miles and the work I cannot do anywhere else. Guilty again. Even while writing this post, I feel guilty that my emotions are front and center when Mom deals bravely with her own fear, rejection and sadness. It helps to journal about these caregiving emotions, include them in my next book, or vent with a friend. The emotions of caregiving are now my reality, and I know they affect me deeply because they are foreshadowed by love. If I didn’t love my mother so much, I wouldn’t care. And because I love her, I’m sad that she can’t be who she used to be. Today your post spoke to my heart. The feelings you are going through are very similar to mine. It’s is a lot like watching my brother suffer progressively from the mental effects he faces (both with and without his medication), and also discovering the many and myriad physical side effects he must deal with that take such a toll on his body. I do also have the grief and the guilt of “knowing what is best for him,” and not, he, himself. The rejection isn’t there, but watching him in a confused state is sadder than I can say. Yesterday was difficult for us. My mother, sister and I all cried at some point. It’s challenging to pick up your feet and move ahead, following that thin but steady beam of light that Jesus shines through the surrounding darkness. The discouragement is great and all around. But this morning I remembered that the light never wavers, that God is faithful. Let that beam continue to guide us and others even when we keep on slipping on our emotions. Thank you for sharing your emotional journey today. Thank you, Amy. Yes, your response is so true and that steady beam of light so important as we persevere. I have to remember that this trial will not last forever, but then – that brings a whole new set of emotions! This is my second Christmas since Jesus gently took my mom’s hand from mine and led her home after several years of Alzheimer’s, nursing home living, going from daughter to just a familiar face that sometimes elicited a smile, sometimes not. I know what I felt then and I know what I feel now. Last Christmas I wrote in my journal ‘mom is celebrating Christmas with Jesus in heaven!’ and realized how much that fact put the hard years into a clearer perspective. She is free, and someday, she and I will laugh about some of the funnier memories I have of the unpredictable things she could do. Yes, sadness, rejection and guilt were my companions, and they can visit again from time to time, but the glory of where mom is now far outweighs those temporary weights I carried. So yes, that long goodbye was tortuous, but I choose to look ahead to that ‘eternal hello’ that I will experience with her when I join her someday. Jesus is the God of yesterday, today and tomorrow, and His love is enough for all three. Merry Christmas, Rebecca. Don’t let today’s sorrow rob you of the promise of joy ahead. Thank you, Nancy, and yes – every time I visit Mom, I am so grateful that she is a believer and will one day be running around heaven – probably telling everybody what to do. Merry Christmas to you as well!